The present work describes a method to fabricate micellar nanocrystals, an emerging major class of nanobiomaterials. This method combines top-down electrospray, bottom-up self-assembly, and solvent-based structure control. The fabrication method is largely continuous, can produce high quality products, and possesses an inexpensive means of structure control. Ding, X., Sun, Y., Chen, Y., Ding, W., Emory, S., Li, T., Xu, Z., Han, N., Wang, J., Ruan, G. Fabrication of Spherical and Worm-shaped Micellar Nanocrystals by Combining Electrospray, Self-assembly, and Solvent-based Structure Control. J. Vis. Exp. (132), e56657, doi:10.3791/56657 (2018). Micellar nanocrystals (micelles with encapsulated nanocrystals) have become an emerging major class of nanobiomaterials. We describe a method of fabricating micellar nanocrystals based on combining top-down electrospray, bottom-up self-assembly, and solvent-based structure control. This method involves first using electrospray to generate uniform ultrafine liquid droplets, each of which functions as a micro-reactor in which self-assembly reaction occurs forming micellar nanocrystals, with the structures (micelle shape and nanocrystal encapsulation) controlled by the organic solvent used. This method is largely continuous and produces high quality micellar nanocrystal products with an inexpensive structure control approach. By using a water-miscible organic solvent tetrahydrofuran (THF), worm-shaped micellar nanocrystals can be produced due to solvent-induced/facilitated micelle fusion. Compared with the common spherical micellar nanocrystals, worm-shaped micellar nanocrystals can offer minimized non-specific cellular uptake, thus enhancing biological targeting. By co-encapsulating multiple nanocrystals into each micelle, multifunctional or synergistic effects can be achieved. Current limitations of this fabrication method, which will be part of the future work, primarily include imperfect encapsulation in the micellar nanocrystal product and the incompletely continuous nature of the process. Nanocrystals such as semiconductor quantum dots (QDs) and superparamagnetic iron oxide nanoparticles (SPIONs) have demonstrated great potential for biological detection, imaging, manipulation, and therapy1,2,3,4,5,6. Encapsulating one or more nanocrystals into a micelle has been a widely used method to interface nanocrystals with biological environments3,6. The thus-formed micellar nanocrystals (micelles with nanocrystals encapsulated) have become an emerging class of nanobiomaterials7,8,9,10. Commonly used methods to fabricate micelles that encapsulate various materials (e.g., nanocrystals, small molecule drugs, and dyes) include film hydration, dialysis, and several others7,11. The present work describes a method of fabricating micellar nanocrystals based on combining top-down electrospray, bottom-up self-assembly, and solvent-mediated structural control. Compared with other fabrication methods of micellar nanocrystals, our method offers several beneficial features: (1) It is a largely continuous production process. This feature is mainly due to the fact that electrospray is used in our method to form emulsion droplets. In contrast, some other methods use vortexing or sonication to form emulsion droplets, thereby making these methods batch processes in nature12. (2) It results in products with high water-dispersibility, excellent colloidal stability, and intact physical functions of the encapsulated nanocrystals. This process can often give products with superior quality compared with other micelle encapsulation methods, to a large extent because electrospray can form ultrafine and uniform emulsion droplets. (3) The structures of the products, including micelle shape and number of encapsulated nanocrystals, can be controlled by the solvent, which is much more inexpensive compared with other ways of control such as changing the amphiphilic polymers used, and can produce not only the commonly available spherical micelle shape but worm-like micelle shape via micelle fusion13. The thus-formed worm-shaped micellar nanocrystals are found to offer greatly reduced non-specific cellular uptake than the spherical counterparts13. On the other hand, it is worth pointing out that this method requires the setup of an electrospray device, which is somewhat more technically demanding (although far from prohibitive) than the need of instrumentation in the other methods. The fabrication method involves first generating ultrafine liquid (often oil-in-water emulsion) droplets with uniform sizes by electrospray, followed by evaporation of organic solvent resulting in self-assembly to form micellar nanocrystals (Figure 1).The electrospray setup has a coaxial configuration using concentric needles: the oil phase, which contains amphiphilic block copolymers and hydrophobic nanocrystals dissolved in organic solvent, is delivered to the inner needle (27 G stainless-steel capillary) with a syringe pump; the water phase, which contains a surfactant dissolved in water, is delivered to the outer needle (20 G stainless-steel three-way connector) with a second syringe pump. A high voltage is applied to the coaxial nozzle. Ultrafine droplets with uniform sizes are generated due to electrodynamic force overcoming surface tension and inertial stress in the liquid. Each droplet essentially functions as a 'micro-reactor', in which, upon removal of the organic solvent by evaporation, the self-assembly 'reaction' occurs spontaneously due to hydrophobic interactions. Using different organic solvents leads to different structures of micellar nanocrystals: a water-immiscible organic solvent chloroform leads to spherical micelle shape, while a water-miscible organic solvent THF with a long reaction time leads to worm-like micelle shape along with enhanced nanocrystal encapsulation. Caution: Due to the use of organic solvents, all operations should be done in a chemical fume hood. Due to the use of high electric voltage, avoid body contact with the apparatus when the power supply is on. Use all appropriate safety practices such as using personal protective equipment (safety glasses, gloves, lab coat, full-length pants, and closed-toe shoes). Consult all relevant material safety data sheets (MSDS). To prepare QD solution, dissolve 10 mg hydrophobic QDs (fluorescent emission peak wavelength = 605 nm, used as the model nanocrystals here) in 20 mL organic solvent (chloroform for producing spherical micelle shape or THF for producing worm-like micelle shape) and vortex for 20 s.
To prepare PS-PEG solution, dissolve 100 mg PS-PEG (amphiphilic block copolymer, with 9.5 kDA PS segment and 18.0 kDA PEG segment) in 10 mL organic solvent (chloroform for producing spherical micelle shape or THF for producing worm-like micelle shape). Mix the solution by vortexing for 1 min (chloroform) or bath sonicate for 2 min (THF). Mix 1 mL of QD solution and 1 mL PS-PEG solution and vortex for 1 min. Add the mixture to Syringe A. The syringe is made of PTFE. To prepare PVA solution, dissolve 400 mg PVA (13-23 kDa, 87-89% hydrolyzed) in 10 mL water in a heated water bath at 60–80 °C for 4–5 h. Allow the PVA solution to cool down to room temperature before use. Add 5 mL of PVA solution to Syringe B. The syringe is made of PTFE. Insert the inner capillary into the outer capillary assembly and gently screw into position. Do not over tighten. Figure 2 shows the overall setup of the coaxial electrospray system. The inner capillary needle is a 27 G (outer diameter 500 µm; inner diameter 300 µm) stainless-steel capillary, and the outer needle is a 20 G (outer diameter 1,000 µm; inner diameter 500 µm) stainless-steel three-way connector. The PTEE tubing used has an inner diameter of 1.8 mm. Load Syringe A on Syringe Pump A as shown in Figure 2. Connect Syringe A to the inner stainless-steel capillary of the electrospray coaxial nozzle using PTFE tubing. Load Syringe B on Syringe Pump B as shown in Figure 2. Connect Syringe B to the outer stainless-steel capillary of the electrospray coaxial nozzle using PTFE tubing. Position the electrospray coaxial nozzle tip approximately 0.8 cm above a grounded steel ring (diameter of 1.5 cm). Place a glass collection dish approximately 10 cm below the coaxial nozzle. With the power supply turned off, connect the ground wire (black wire in Figure 2) to the grounded steel ring. With the power supply turned off, connect the positive terminal (red wire in Figure 2) of the power supply to the inner needle of the coaxial nozzle using a metal alligator clip. Set the speed of Syringe Pump A to 0.6 mL/h. Set the speed of Syringe Pump B to 1.5 mL/h. Start both syringe pumps and wait for their respective flow rates to stabilize. Drops forming at the nozzle at a steady rate indicate a stable flow rate. This usually occurs within 60 s after starting syringe pumps. NOTE: There should be no bubbles in the tubing and droplets should form at the electrospray coaxial nozzle. Turn on the power supply to apply a positive high voltage to the electrospray coaxial nozzle. Adjust the applied voltage within the range of 5–9 kV, until a concave cone-jet (i.e., a convergent jet, commonly known as a 'Taylor cone') is observed at the tip of the coaxial nozzle (as shown in the inset of Figure 3a). Caution: Be sure not to touch electrospray nozzle when high voltage is applied. Follow appropriate safety precautions. NOTE: Insufficient applied voltage will result in droplets forming at the tip of the nozzle (as shown in the inset of Figure 3b), while too high of applied voltage will cause an electrical arc between the nozzle and the grounded steel ring. After a stable Taylor cone (Figure 3a) has been obtained, add 10 mL deionized water to a clean collection dish and replace the glass collection dish in the setup. The new dish will collect the micellar nanocrystal product. Run the micellar nanocrystal production process for a certain time duration (for approximately 40 min for producing spherical micelle shape or approximately 90 min for producing worm-like micelle shape). Then remove the collection dish from underneath the electrospray nozzle. Stop Syringe Pump A and B. Turn off the high voltage power supply. Allow the organic solvent to evaporate (in a fume hood) from the uncovered collection dish overnight. NOTE: Judging from the characterization results of the micellar nanocrystal products, evaporation overnight is sufficient for removing the organic solvent to obtain products with good quality. Finally, transfer the micellar nanocrystal product to a 15 mL centrifuge tube for characterization (e.g., fluorescent spectroscopy, dynamic light scattering, transmission electron microscopy, and thermal analysis), application, or storage. Store the final micellar nanocrystal product in a refrigerator at 4 °C. NOTE: The product can remain stable under this storage condition for at least one month. Figure 1 shows a schematic summarizing the control of structures (shape and encapsulation) of micellar nanocrystals by the organic solvent used in the production process. Briefly, dichloromethane leads to spherical micelles with no encapsulation of nanocrystals; chloroform leads to spherical micelles with a low encapsulation number of nanocrystals; THF leads to spherical micelles with a high encapsulation number of nanocrystals at a short reaction time and worm-shaped micelles with a high encapsulation number of nanocrystals at a long reaction time, respectively. 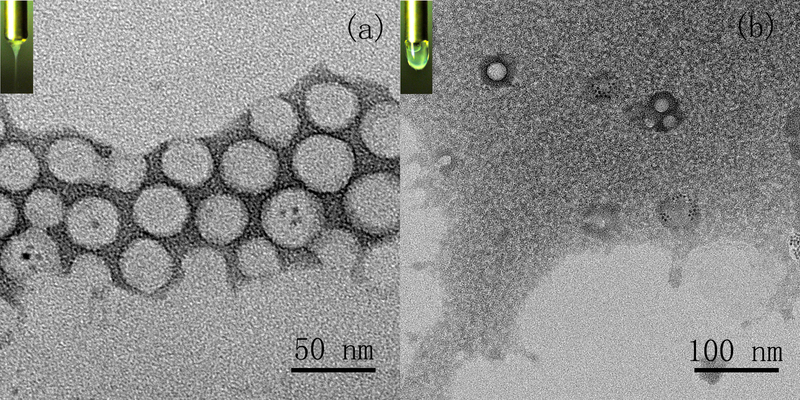 The micellar nanocrystals with spherical shape produced using chloroform as the organic solvent have a particle size of ~35 nm (by transmission electron microscopy (TEM); Figure 3a). A key quality control method to ensure successful production is using the Taylor cone: adjusting the voltage within the range of 5–9 kV until a concave cone-jet (Taylor cone) is formed, thus ensuring formation of the 'micro-reactors' in which the self-assembly 'reaction' occurs (Figure 3a). As comparison, Figure 3b shows a photo of the appearance of the liquid flow at the nozzle tip and a TEM image of the products when the Taylor cone is not properly formed. Worm-like micelle shape is produced by using the water-miscible THF as the organic solvent. THF can induce/facilitate the fusion of spherical micelles, forming a worm-like shape (Figure 4)13. Figure 4a, Figure 4b, and Figure 4c show the TEM images of the products at production times of 30 min, 60 min, and 90 min, respectively. It can be seen in Figure 4 that increased production time leads to increasingly more worm-shaped micellar nanocrystals, and that by 90 min virtually all micellar nanocrystals are in worm-like shape. In addition, nanocrystal encapsulation in micelle is also enhanced by using THF as the organic solvent. 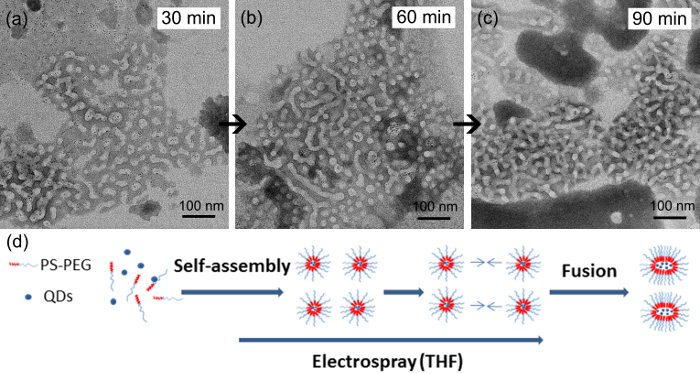 Figure 1: Schematic of the production process of micellar nanocrystals combining top-down electrospray, bottom-up self-assembly, and solvent-based structure control. Using dichloromethane leads to empty spherical micelles (spherical micelles with no encapsulation of nanocrystals); using chloroform leads to spherical micelles with low encapsulation number of nanocrystals; using THF leads to spherical micelles with high encapsulation number of nanocrystals at a short reaction time and worm-shaped micelles with high encapsulation number of nanocrystals at a long reaction time, respectively. This figure has been modified from Ding et al.13 Please click here to view a larger version of this figure. Figure 2: Schematic of the fabrication device of micellar nanocrystals. The schematic shows the overall setup of the coaxial electrospray system that is mainly made of four parts: 1) coaxial nozzle and steel ring, 2) glass collection dish, 3) syringe pump A and syringe pump B, and 4) high voltage power supply. 1) The electrospray coaxial nozzle tip is placed approximately 0.8 cm above a grounded steel ring. 2) The glass collection dish is placed approximately 10 cm below the coaxial nozzle. 3) On syringe pump A, Syringe A is connected to the inner stainless-steel capillary of the electrospray coaxial nozzle using PTFE tubing to apply QD solution and PS-PEG solution. 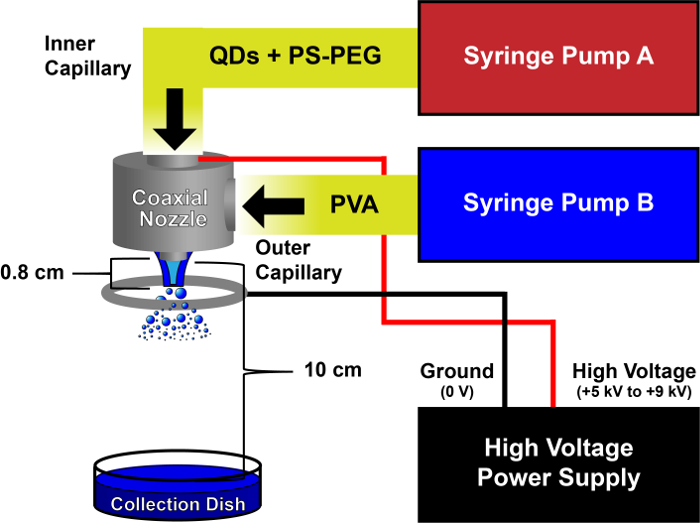 On syringe pump B, Syringe B is connected to the outer stainless-steel capillary of the electrospray coaxial nozzle using PTFE tubing to apply PVA solution. 4) The positive terminal of the power supply (red wire) is connected to the inner needle of the coaxial nozzle while the ground wire (black wire) is connected to the grounded steel ring, and the range of voltage is from +5-9 kV. Please click here to view a larger version of this figure. Figure 3: Micellar nanocrystals with spherical shape produced by combining electrospray, self-assembly, and chloroform as the organic solvent, with proper Taylor cone formation at the coaxial nozzle tip as a key quality control method. (a) TEM image of the product after a successful production process. Inset: appearance of properly-formed Taylor cone at the coaxial nozzle tip. (b) TEM image of the product after an unsuccessful production process. Inset: appearance of improperly-formed Taylor cone at the coaxial nozzle tip. This figure has been modified from Ding et al.13 Please click here to view a larger version of this figure. Figure 4: Micellar nanocrystals with worm-like shape produced by combining electrospray, self-assembly, and THF as the organic solvent. (a) TEM image of the product after reaction for 30 min. (b) TEM image of the product after reaction for 60 min. (c) TEM image of the product after reaction for 90 min. (d) Schematic showing the mechanism of formation of worm-shaped micelles by THF. This figure has been reproduced from Ding et al.13 Please click here to view a larger version of this figure. The fabrication method of micellar nanocrystals described in the present work combines top-down electrospray, bottom-up self-assembly, and solvent-based structure control. An effective and convenient quality control method is to use the Taylor cone formed at the coaxial nozzle tip. This is because a properly formed Taylor cone indicates balance (or near balance) between electric force and surface tension, which in turn indicates successful formation of micro-reactors (uniform ultrafine droplets) for the self-assembly reaction to occur spontaneously. In the event that the Taylor cone is not properly formed, one should adjust the voltage of the power supply and the flow rates of the syringe pumps, while ensuring the distance between the coaxial nozzle tip and the grounded steel ring is suitable, until a properly formed Taylor cone is observed. One approach for obtaining a stable Taylor cone is to increase the high voltage until the electrons begin arcing between the electrospray nozzle tip and the grounded steel ring. At that point, reduce the electrospray voltage by 0.5–1.5 kV and no arcing occurs. If a stable Taylor cone is still not formed, carefully observe the liquid emerging from the nozzle tip. If drops of liquid sporadically appear, systematically reduce the syringe pump flow rates until a stable Taylor cone is observed. If no drops are observed at the nozzle tip, systematically increase the flow rates of the syringe pumps until a stable Taylor cone is observed. In addition, the distance between the coaxial nozzle tip and the product collection dish should be maintained at a proper value. If the distance is too small, the evaporation of organic solvent could be too slow and the micellar nanocrystal formation process could be negatively affected; on the other hand, if the distance is too large, a great amount of materials could be lost in the form of aerosol during the production process. Finally, the concentrations of polymers and QDs should be maintained at proper values. If the polymer concentration is too low, micelle may not form because a critical polymer concentration needs to be reached for micelle formation; if the polymer concentration is too high, nearly all micelles formed would be empty micelles. Similarly, if the QD concentration is too low, nearly all micelles formed would be empty micelles. If the QD concentration is too high, many QDs would not be encapsulated into micelles. The micellar nanocrystals produced can have multiple nanocrystals in each micelle, permitting multifunctional (e.g., both fluorescence and magnetism when QDs and SPIONs are co-encapsulated) or synergistic effects (e.g., color-changing composite nanoparticle formed by co-encapsulating QDs with two different fluorescent colors)8,9,10,14,15,16,17,18. The production method could also be applied to encapsulate other nanoscale materials such as carbon nanotubes and gold nanorods. The worm-shaped micelles can offer minimized non-specific cellular uptake, thus enhancing biological targeting13. The micellar nanocrystal products can be readily conjugated with a variety of biomolecules using well-established bioconjugation techniques, and be applied for biological imaging, detection, manipulation, and therapy. The present fabrication process permits production of both spherical and worm-shaped micellar nanocrystals. Worm-shape can be achieved by using THF as the organic solvent and a long reaction time. In addition, it was also observed that when a high polymer concentration (e.g., 20 mg/mL in the above protocol) was used, even at a short reaction time (with THF as the organic solvent), some worm-shaped micelles could be formed. However, using such a high polymer concentration could easily lead to aggregation. A limitation of the present fabrication process is that the nanocrystal encapsulation in micelle is still limited (with THF as the organic solvent the percentage of empty micelles is ~50% and the percentage of micelles with two or more nanocrystals encapsulated is ~20%, and with chloroform as the organic solvent the percentage of empty micelles is ~80% and the percentage of micelles with two or more nanocrystals encapsulated is ~10%)13, although it generally gives improved nanocrystal encapsulation effects compared with the conventional film hydration method (giving >80% empty micelles using similar material conditions in tests conducted in our lab). Fundamentally, this limitation is due to the fact that, compared with small molecule dyes and drugs, nanocrystals are much bulkier, and are thus limited in transport rate. In other words, the nanocrystal encapsulation is limited by kinetics rather than thermodynamics13. The transport-limiting effect is especially pronounced when large objects (in this case nanocrystals with a few nanometers in diameter) are encapsulated into small capsules (in this case micelles with ~35 nm in diameter). Thus, further improving nanocrystal encapsulation will be a major goal of the future work. Another limitation of the present fabrication process is that it is not yet completely continuous. This is mainly because the product collection part of the process is still a batch process in nature, which will be tackled in the improved version of the process. The authors gratefully acknowledge the financial support of a "Thousand Young Global Talents" award from the Chinese Central Government, a "Shuang Chuang" award from the Jiangsu Provincial Government, start-up fund from College of Engineering and Applied Sciences, Nanjing University, China, award from the "Tian-Di" Foundation, grant from the Priority Academic Program Development Fund of Jiangsu Higher Education Institutions (PAPD), grant from the Jiangsu Province Natural Science Fund. Hydrophobic quantum dots Ocean Nanotech QSP Solid hydrophobic CdSe/ZnS quantum dots. Peak fluorescence emission wavelength is 605 nm. Poly(styrene)-b-poly(ethylene glycol) (PS-PEG) Sigma-Aldrich 666476-500MG Molecular weight of PS segment is 9.5 kDa and that of PEG segment is 18.0 kDa. Poly(vinyl alcohol) (PVA) Sigma-Aldrich 363170-500G Molecular weight 13–23 kDa, 87–89% hydrolyzed. Tubing Shanghei Lai Xing 2 mm outer diameter and 1.8 mm inner diameter PTFE tubing. Syringes Yi Ming 5.CC 5 mL disposable syringe made of PTFE. High voltage power supply Dong Wen DW Series Direct current power supply (0–50 kV range). Electrospray coaxial nozzle Hunan Chang Sha Na Yi Stainless steel assembly. Inner capillary needle was a 27 gauge (outer diameter 500 μm; inner diameter 300 μm). Outer capillary was a 20 gauge (outer diameter 1,000 μm; inner diameter 500 μm). Vortexer Xi'an HEB Biotechnology Co., Ltd. China MX-S MX-S with wide speed range of 0–2,500 rpm, stepless speed regulation, touch and continuous operations. Steel ring Yiwu Wan Tu Rings with a range of diameters (0.8–1.8 cm) can be constructued. For example, a 1.3 cm diameter ring was constructed by curling an approximately 25 cm (length) of 0.5-mm diamter (24 gauge, AWG) steel wire. Glass collecting dish Grainger 1u5084 25-mm height and 120-mm diameter glass dish. 15 mL centrifuge tube Jiangsu Xinkang Medical Instrument Co., Ltd. X-407 Centrifuge tube is made of transparent polypropylene (PP). Nie, S., Xing, Y., Kim, G. J., Simons, J. W. Nanotechnology Applications in Cancer. Annu. Rev. Biomed. Eng. 9, 257-288 (2007). Smith, A. M., Ruan, G., Rhyner, M. N., Nie, S. M. Engineering Luminescent Quantum Dots for In Vivo Molecular and Cellular Imaging. Annals Biomed. Eng. 34, (1), 3-14 (2006). Heath, J. R., Davis, M. E. Nanotechnology and Cancer. Annu. Rev. Medicine. 59, 251-265 (2008). Pu, K., Chattopadhyay, N., Rao, J. Recent advances of semiconducting polymer nanoparticles in in vivo molecular imaging. J. Control. Release. 240, 312-322 (2016). Swierczewska, M., Han, H. S., Kim, K., Park, J. H., Lee, S. Polysaccharide-based nanoparticles for theranostic nanomedicine. Adv. Drug Deliv. Rev. 99, 70-84 (2016). Gao, X. H., Yang, L. L., Petros, J. A., Marshal, F. F., Simons, J. W., Nie, S. M. In vivo molecular and cellular imaging with quantum dots. Curr. Opin. Biotechnol. 16, (1), 63-72 (2005). Dubertret, B., Skourides, P., Norris, D. J., Noireaux, V., Brivanlou, A. H., Libchaber, A. In vivo imaging of quantum dots encapsulated in phospholipid micelles. Science. 298, (5599), 1759-1762 (2002). Ruan, G., et al. Simultaneous magnetic manipulation and fluorescent tracking of multiple individual hybrid nanostructures. Nano Lett. 10, (6), 2220-2224 (2010). Ruan, G., Winter, J. O. Alternating-color quantum dot nanocomposites for particle tracking. Nano Lett. 11, (3), 941-945 (2011). Park, J. H., von Maltzahn, G., Ruoslahti, E., Bhatia, S. N., Sailor, M. J. Micellar hybrid nanoparticles for simultaneous magnetofluorescent imaging and drug delivery. Angewandte Chemie-International Edition. 47, (38), 7284-7288 (2008). Torchilin, V. P. PEG-based micelles as carriers of contrast agents for different imaging modalities. Adv. Drug Deliv. Rev. 54, (2), 235-252 (2002). Sun, Y., et al. Examining the roles of emulsion droplet size and surfactant in the interfacial instability-based fabrication process of micellar nanocrystals. Nanoscale Research Letters. 12, 434 (2017). Ding, X. Y., Han, N., Wang, J., Sun, Y. X., Ruan, G. Effects of organic solvents on the structures of micellar nanocrystals. RSC Advances. 7, (26), 16131-16138 (2017). Sailor, M., Park, J. Hybrid nanoparticles for detection and treatment of cancer. Adv. Materials. 24, (28), 3779-3802 (2012). Jing, L. H., Ding, K., Kershaw, S. V., Kempson, T. M., Rogach, A. L., Gao, M. Y. Magnetically engineered semiconductor quantum dots as multimodal imaging probes. Adv. Materials. 26, (37), 6367-6386 (2014). Bao, G., Mitragotri, S., Tong, S. Multifunctional nanoparticles for drug delivery and molecular imaging. Annu. Rev. Biomed. Eng. 15, 253-282 (2013). Mura, S., Couvreur, P. Nanotheranostics for personalized medicine. Adv. Drug Delivery Rev. 64, (13), 1394-1416 (2012). Louie, A. Y. Multimodality imaging probes: design and challenges. Chem. Rev. 110, (5), 3146-3195 (2010).